Heat the oil in a large heavy-based saucepan over medium heat. Add the onion, carrot and garlic, and cook for 4–6 minutes until softened. Add the beef mince and cook, breaking up any large lumps with a wooden spoon, for 8–10 minutes or until browned. Add the tomato, pancetta, thyme, rosemary, vinegar, sugar, salt and pepper, and mix to combine. Bring to a simmer, reduce heat to low, cover with a lid and cook for 30 minutes or until thickened and reduced. While the sauce is cooking, cook the pasta in a large saucepan of salted boiling water for 6–8 minutes or until al dente. Drain. 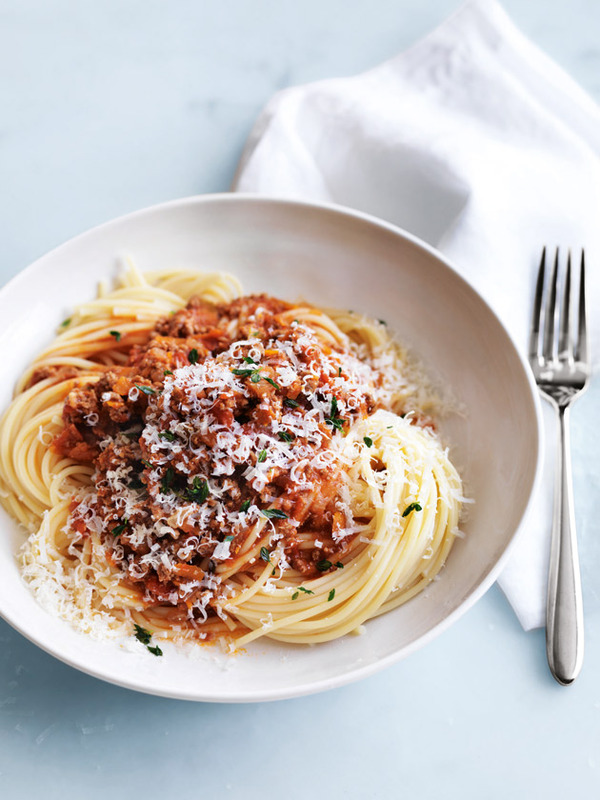 Divide between bowls and top with the bolognaise and parmesan to serve. Serves 4.